In my last post, I argued that an investor in Kylie Jenner’s cosmetics company was essentially investing in Ms. Jenner’s personal brand, and that the earnings stream for that brand was of a finite life. The post got me thinking: is it actually possible to invest in the future earnings of a specific, individual celebrity? Has anyone ever done that, and if so, how did it go? The short answer is “yes” and “not very well”. For the longer answer, keep reading. In 2012, a company called Fantex Inc. was incorporated. Fantex’s business was to invest in minority stakes (typically 10% ) of the future earnings (from both on-field performance and endorsements) of professional athletes. It would raise money from the public in exchange for athlete-specific classes of common shares, and would pay the athletes a lump sum in exchange for the right to a share of their future earnings. Shareholders would receive dividends based on the pro-rata performance of their athletes. The following table shows a list of some of Fantex’s early investments in National Football League players. How have these investments done? Well, it depends. The investment in Mohammed Sanu has turned out nicely. 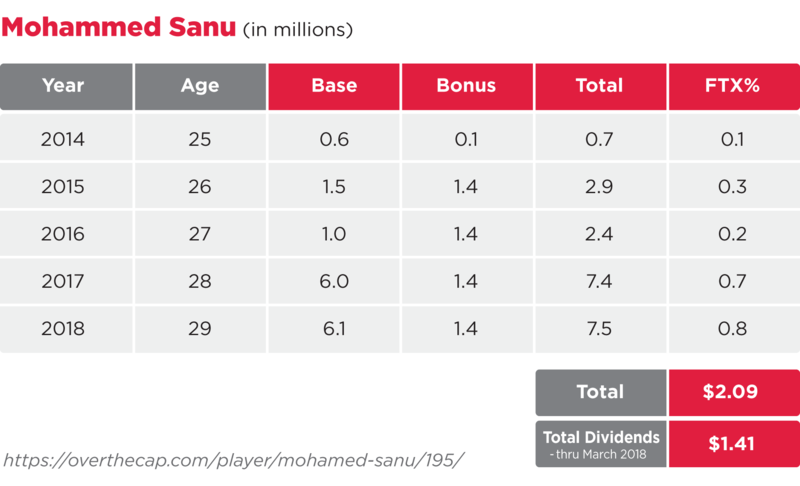 Sanu, who earned fairly little on his rookie contract with the Cincinnati Bengals, signed a big contract with Atlanta in 2016 (following his deal with Fantex), earning a base salary of $6M per year the past few years. His tracking stock has already paid out $1.41M in dividends to shareholders (close to the initial $1.63M raised), and he stands poised to earn over $6M per year over the next three years with the Falcons, although none of the money is guaranteed. On the other hand, if you invested in the E.J. Manuel stock issue – well, let’s just say that your investment worked out about as well as every Buffalo Bills quarterback since the Doug Flutie era. The E.J. 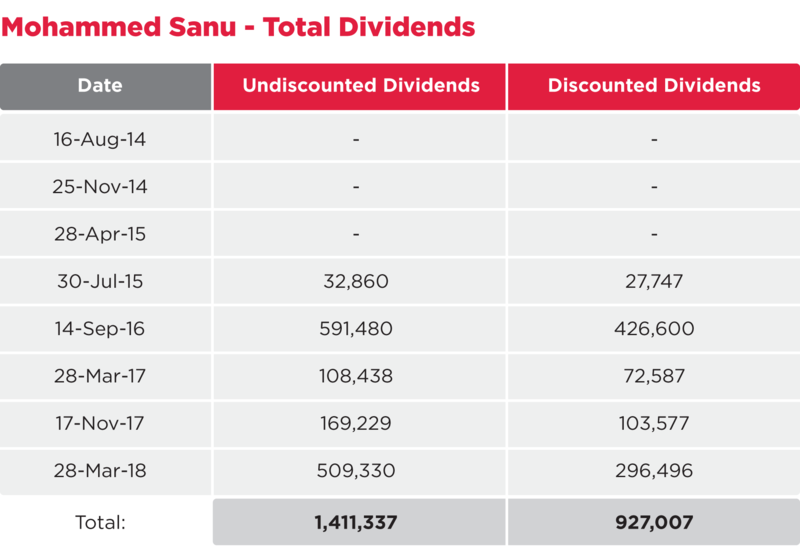 Manuel tracking stock has issued total dividends of only $0.41M, a mere fraction of the $5.2M that was raised to acquire a 10% stake in Manuel’s future earnings. Overall, it appears that Fantex’s investments have underperformed; the company had a deficit of $14M as at September 30, 2016, the last published financial statement date before the company was delisted. Valuing Fantex’s contracts is really no different that valuing shares in a company: it is a function of three factors: the size, duration and risk of the future projected cash flows of the investment. Fantex’s public filings make for interesting reading, and they talk about each of these valuation inputs. As part of its financial reporting, Fantex would need to re-value its contracts with its roster of athletes each year, adjusting its assessments of fair market value based on its estimates of future performance in light of how the athlete fared in the previous year; the deficit of $14M is largely a function of the write-down in value of underperforming contracts. Discount rate of 4.5% to 20%, with a weighted average of 14.6%. Career length (I assume this means from the beginning of the player’s career: 5 to 16 years, with a weighted average of 9.7 years. Size of contract: $0.4M to $81.4M, with a weighted average of $23.9M. My initial sense is that these assumptions seem fairly optimistic, given the average length on an NFL career is only 2.6 years, and has been decreasing recently, although of course once a player becomes more established the expected career length will tend to increase. Based on the above, Mr. Sanu will need to remain healthy and avoid being cut by the Falcons the next couple of seasons in order for his investors to break even. I’ll have more to say about the idea behind Fantex , which more recently has expanded into other sports such as golf and baseball. But given that Fantex is no longer publicly traded, would-be NFL investors may need to suffice with the less expensive option of fantasy football.